HowToRepairGuide.com: How to remove front rotors on Kia Spectra? 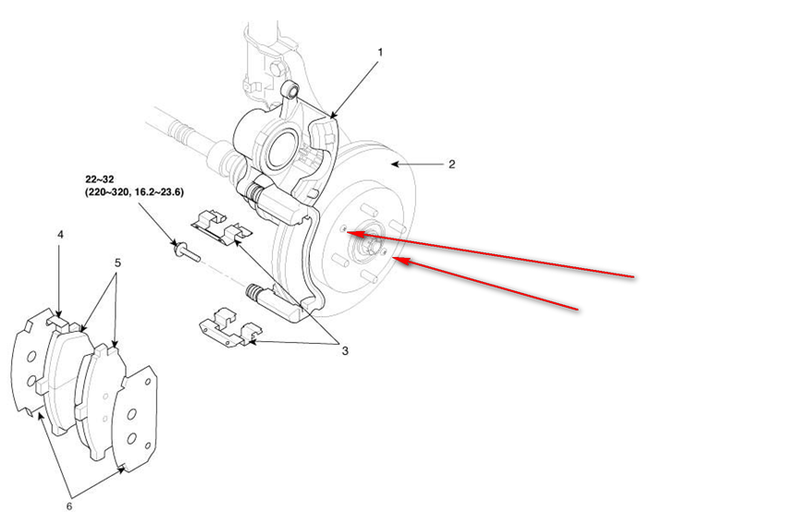 Remove the knickle assy by the lower ball joint, tie rod end, & 2 lower strut mounting bolts. Than taking the assy to a 60 ton press to break the rotor loose. This puts less stress on the bearing and hub assy. But in some cases its very tight to remove the rotor, in that cases hammer has to be used, thats the only option. The result of using a slide hammer to pull the hub, Which had a press fit to the inner race and therefore one half stays on the hub. So, new bearing , new hub, new rotor and never seize between rotor and hub to put back together. Bolt through caliper mounts with nuts between rotor and mount, use as a press to pop the rotor loose. Or Heat the face between studs and hammer on face to release. Make sure there are not 2 screws here that need to be removed, if there are then remove them. If these holes are threaded then use a bolt in there place to push the rotor off. If the rotor is different and or this does not help its time for force.You are going to need a sledge hammer 10 pound minimum and strike the back of the rotor where the caliper would be. This is easier on a rack, if on the ground make sure to really support the vehicle so it does not fall. Its amazing how the rust buildup on the hub can hold on that tight. You are now left with few options and the result is more parts. You can remove the hub and rotor as one and get it on a hydraulic 20 ton press to seperate it or use a torch and cut the rotor off and replace the rotor which is going to be damaged during this. I have had to do each of those about 3-4 times normally the sledge hammer wins either by breaking it loose or cracking the rotor into 2 pieces and it falls off. Normall yafter all this beating the hub bearing soon fails. Labels: front rotors removing on kia spectra, How to remove front rotors on Kia Spectra, Kia front rotor removal procedure.